October is National Bullying Prevention Month and the message of this year’s awareness campaign is “The End of Bullying Begins with Me.” This is a message that should resonate with everyone including parents, coaches, teachers, and teens. 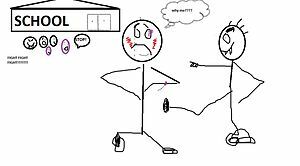 Most of us have had to deal with a bully at some point in our lives and therefore, we all know how damaging and lasting those kinds of interactions can be. This month you can make a difference in your family, your school, and your community by participating in activities geared towards raising awareness and empowering others to help put an end to bullying. There are many ways you can take advantage of the national bullying campaign and do something to educate others, engage your peers, and encourage everyone to take the pledge to be part of the solution. Here are some great ways you can get involved and help spread the word that the end of bullying begins with each of us. This is a fun way to get everyone in your community involved. Communities around the country will be participating in this unique version of a “Walk-a-thon”. Participants help raise awareness about bullying while also raising money to support local anti-bullying programs. Most events are scheduled for October 6th this year and you can download a kit with all the information you need to plan your own Run, Walk, Roll event on the National Bullying Prevention Website. On October 10th, people across the country will be wearing orange as a way to raise awareness about bullying and the importance of preventing bullying behavior in all areas of our lives. Participate in Unity Day by donning orange or get more involved and organize some Unity Day activities at your school. Follow Unity Day on Facebook for ideas and information. Stand-up for what you believe in by signing the online “The End of Bullying Begins with Me” petition. Take this a step further and encourage those around you to sign it too. If you are participating in or hosting an anti-bullying event, provide the means for other attendees to sign the petition too. Ask local churches, groups, schools, and community organizations if you can come and speak to them about bullying. Sharing your story is one of the most powerful ways to spread awareness and help people understand the long term consequences and real-life impacts bullying behavior can cause. If your school is having an assembly, volunteer to speak. Talk to your school paper about writing a story or an article. Make a video and share it through social media. Bring your community together to celebrate unity and inclusiveness and cultivate a culture where bullying is non-existent. Whether you choose a fall festival, a street fair, a dance, or a rally, the most important thing is getting people together to raise awareness and encourage everyone to embrace the idea that the end of bullying begins with each of us.